The For Lease Swooper Flag is Priced to Sell! Real Estate Banners Come in Dozes of Varieties! The Custom For Lease Swooper Flag is Available as well! 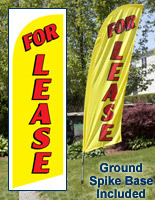 FOR LEASE flag mounts on a ground spike for set up on front lawns. 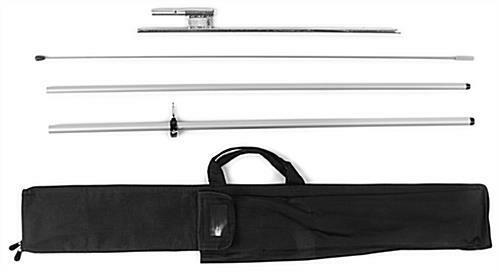 4-Piece fiberglass and aluminum pole is low cost and bows in the wind. Black bag allows agents to transport the FOR LEASE flag effortlessly. Knitted polyester fabric construction for outdoor use. 8' Height and white lettering on blue background is easy to see. 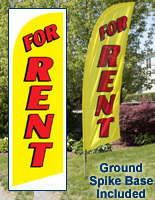 This feather banner is a FOR LEASE flag that has a ground spike base for posting in the front lawn of a property. Real estate agents will experience an increased number of inquiries and leads on practically any residential or commercial property where these outdoor displays are posted. 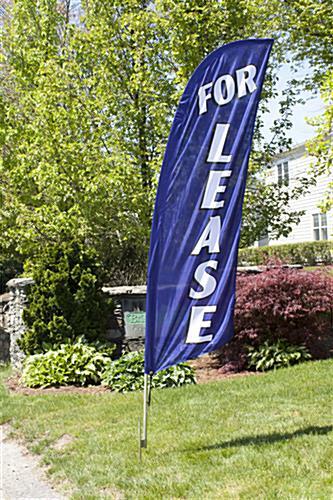 The FOR LEASE flag that flutters in the wind is not only easier for potential renters to see than a traditional real estate sign, but also the carefully engineered design is inexpensive by comparison. 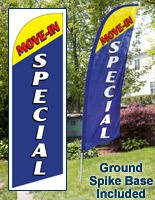 A pole consisting of four segments, (2) aluminum and (2) fiberglass, comes with each feather banner. 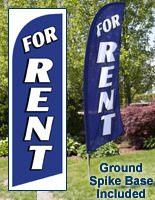 The FOR LEASE flag, also known as a real estate sign, is ultra-light weight as a result. An intuitive design and light weight means only one person is needed to set up this display. The 8' FOR LEASE flag includes a ground spike base because it is the style of base most preferred by real estate agents. Wherever there is grass or exposed ground, agents can hammer in the ground spike in a manner of seconds, then simply pull it out of the ground once the showing is complete. 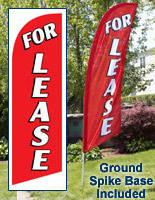 The FOR LEASE flag that has a ground spike allows brokers to place these promo pennants anywhere there is grass. 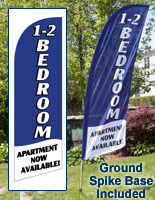 A nylon bag comes with the purchase of each banner for carrying to and from commercial properties or homes. The bag has a separate compartment for each component of this FOR LEASE flag. Agents and property managers can transport the display with ease to any location when using the bag. Additionally, the compartmentalized design of the carrying case ensures pieces stay organized and reduces the risk of losing any piece of the FOR LEASE flag. There are many reasons this banner is one of the most effective real estate displays on the market. The FOR LEASE flag has bold white font on a blue background, which potential lessees will see in the most competitive of real estate markets. Furthermore, the 8' height is small enough only one person is required for assembly, yet large enough that everyone whom drives by the banner will read it. The combination of low price point, portability and eye-catching design results in these flags offering maximum return on investment return for agents and property managers!